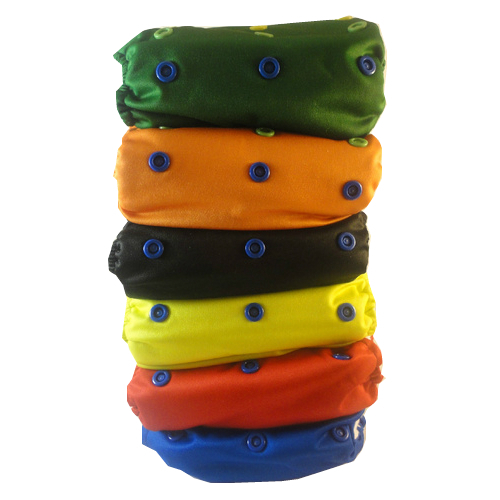 Many parents are seeking out cloth diapers because the expense of using disposables is overwhelming. They look into cloth, see some of the cute little calculators breaking down the savings and BOOM they're starting a stash. Then they see an ultra cute diaper, but WHOA... the price tag! It's true. Many a money-saver has succumb to the ultra cute, ultra bank-breaking cloth diaper addiction. How can you feed your cute cloth addiction and ensure you're still saving money? Glow Bug diapers. They ONLY sell diapers in packages. This guarantees that you're getting the most bang for your buck, and allows them to reduce the cost per diaper because every customer is buying in bulk! They have adorable prints, vivid colors, and seasonal diapers to keep an eye out for. Let's look at all the spec's together, shall we? SlimDry fabric. It is exactly what it sounds like. Fabric designed to stay dry without the bulk. Wing snaps on top row to prevent dropping. Droopy butts are so uncool. Just look at some of the cuteness you can buy in their packages! So if you're considering cloth diapers, know someone who is thinking about it, or just need to beef up your current stash, get thy money saving tush to Glow Bug diapers and check out their BIGGEST SALE EVER!